I would say that it was only yesterday that A BLIND ARCHITECT, the short video docu (14 min) I was commissioned to do by APCD and JICA was truly finished. 700 copies were ordered for distribution. I was tasked to show and share 100 copies of it. My plan is to show it preceding all the future screenings of my feature-docus ALYANA and SO starting next week, July 21. Because it has options as sign language interpretations for Deaf accessibility—both in FSL (Filipino Sign Language) and ASL (American Sign Language) it would greatly help our Deaf brothers and sisters to understand faster the concept of Non-Handicapping Environment (NHE) which hopefully would ripple in our country. Two projects are now being undertaken here—in Opol, Misamis Oriental and in Lucena in Iloilo. The film was first shown on July 2, 2009 to APCD and JICA representatives from Thailand, SM personnel and UAP representatives and other PWD stakeholders. 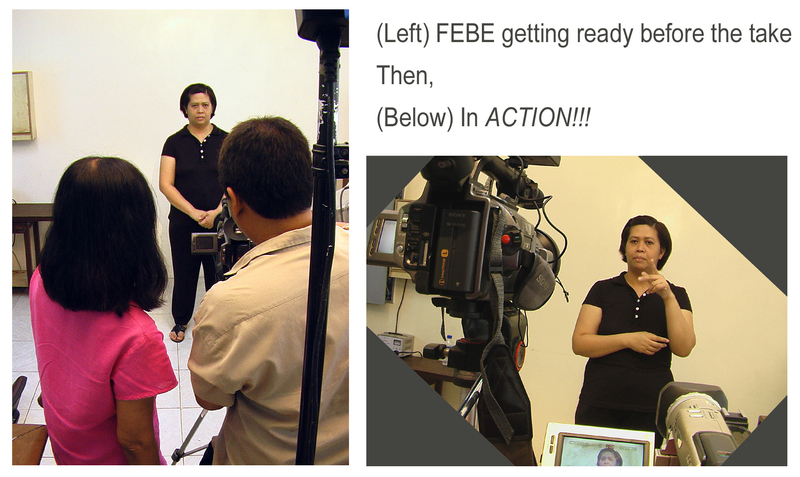 The sign language interpretation for the film was adeptly done by Febe Sevilla (see below) , one of the best interpreters in the country. I have seen the film on PIID’s recent congregation and I only wish to share it with my students in Mapua. The film is about everything they sould know about accessibility design in the Philippines and I am sure that this will greatly awaken their awareness as they start they design careers. I would like to inquire how to request for a film showing of “A Blind Architect”. Thanks so much and I will be looking forward to your reply. A similar request from the UP Sped Area is now pending at APCD, the film’s producer. I am still waiting for their reply. However, Arch. Silva has no problem re sharing it with anybody interested in showing it. Since you are addressing your message to, I guess Arch. Silva, I will forward it to him, although I can, as director, show and share the film on behalf of the producers for awareness purpose in case no one is around to share it with you. It is the film’s aim to spread the concept of Non-Handicapping Environment asap! Thanks for your interest in the film. You post informative articles Just bookmarked !!! Merely wanna remark that you have a very nice internet site , I enjoy the design and style it actually stands out. Thanks for another informative website. Where else could I get that kind of info written in such an ideal way? I have a project that I’m just now working on, and I have been on the look out for such information. Just discovered that blog thru Yahoo, which a pleasant shock! I have been exploring for a little bit for any high-quality articles or blog posts on this sort of area . Exploring in Yahoo I at last stumbled upon this site. Reading this info So i’m happy to convey that I have a very good uncanny feeling I discovered exactly what I needed. I most certainly will make certain to do not forget this site and give it a look regularly. Welcome to the blogging community…once started, it will become habitual. It just needs discipline. You really ought to spare some of your time to it. And it will only become really useful when we think of others who’d spare equal time to read our blog. To keep it going, you have to really write on matters that interest you. Thank you for dropping by. I think this web site has some real fantastic information for everyone : D.
I’m very lucky to get this information from you.|very good information. Thanks giving the knowledge. I uncovered the knowledge tremendously of great benefit. I merely found your site and also rapidly scanned together. I spotted a number of unusual comments, yet in most cases I simply accept the style the some other commenters assertions. Considering the variety of great testimonials of this web site, I was thinking that we also need to start as well as let you know that I truly enjoyed looking over this your articles. Therefore i think this may be my first comment: “I can see you’ve built a number of important things. Made men and women truly contemplate it the way you merely would. Now i’m really pleased there’s so much relating to this topic that has been uncovered so you made it happen thus effectively. I am really thankful to author who work tough to write this post. Its extremely informative write-up. Thanks once more. Thank you for establishing your blog web site, We proudly located yourself on Yahoo and google. I must say i like your web site. Very creative articles or blog posts! I must say i like yuor web blog. Good threads! You should keep on publishing this type of impressive cotent. Ought to join your blog, great publish. Found it with yahoo. Your effort is actually appriciated. I just heard about your site the other day and I have been checking it out often. You have a lots of good info here and I really like the actual design of the web page also. Keep up the great work! Youre so cool! I dont suppose Ive learn anything like this before. So good to search out any individual with some unique ideas on this subject. realy thanks for starting this up. this website is one thing that’s wanted on the net, somebody with somewhat originality. helpful job for bringing something new to the internet! I haven’t thought of A BLIND ARCHITECT Advocacine’s Blog this way. I have to tell you I am keen on your website. by the way! You’ll want to put some additional photos and videos in https://advocacine.wordpress.com/a-blind-architect/, doing this it will considerably even more fascinating for coming guests. Hope that can help! I really like what you have written. It was very educational and it’s not easy to find such an fascinating content that actually grabs my attention. Awesome stuff! I will without a doubt be returning back here for more! Are you really the owner of A BLIND ARCHITECT Advocacine’s Blog, this is an amazing site! Congrats :). So I’ve been kind of following it for a while because I run a really similar website. Will need to subscribe to this website, amazing posting. Found it regarding aol. Some genuinely terrific work on behalf of the owner of this internet site , dead great subject matter. your page is so great, like i never seen before. Deffenetly, that can be first page on internet! After examine a few of the weblog posts in your website now, and I truly like your approach of blogging. I bookmarked it to my bookmark web site list and will probably be checking again soon. Pls check out my web page as effectively and let me know what you think. I am going to go ahead and save this content material for my brother for a research project for school. This is a attractive site by the way. Exactly where did you get the theme for this website? I was looking through some of your content on this site and I think this internet site is really informative ! Retain putting up. I™m impressed, I must say. Truly rarely do I encounter a blog thatâ€™s both educative and entertaining, and let me let you know, you’ve got hit the nail on the head. Your notion is outstanding; the concern is something that not enough men and women are speaking intelligently about. I’m very pleased that I stumbled across this in my search for something relating to this. Glad to be one of a lot of visitants on this wonderful internet internet site : D.
Outstanding post, I conceive individuals ought to larn a great deal from this weblog its really user friendly . Im impressed, I ought to say. Extremely rarely do I come across a weblog thats both informative and entertaining, and let me tell you, youve hit the nail on the head. Your blog is important; the concern is something that not sufficient people are talking intelligently about. Im truly happy that I stumbled across this in my search for something relating to this issue. I ought to say, youve got 1 of the very best blogs Ive seen in a lengthy time. What I wouldnt give to have the ability to create a blog thats as intriguing as this. I guess Ill just need to keep reading yours and hope that one day I can write on a subject with as substantially understanding as youve got on this 1! I absolutely love your blog and find many of your post’s to be exactly what I’m looking for. Does one offer guest writers to write content in your case? I wouldn’t mind publishing a post or elaborating on a few of the subjects you write about here. Again, awesome blog! Oh sure! Any related subject on this matter is most welcome. Thanks!